Viola Turpeinen, the first recorded woman accordionist? Today is International Women’s Day, and I’ve been writing about Viola Turpeinen. We’ll feature her on Accordion Noir’s annual women’s show tomorrow night. 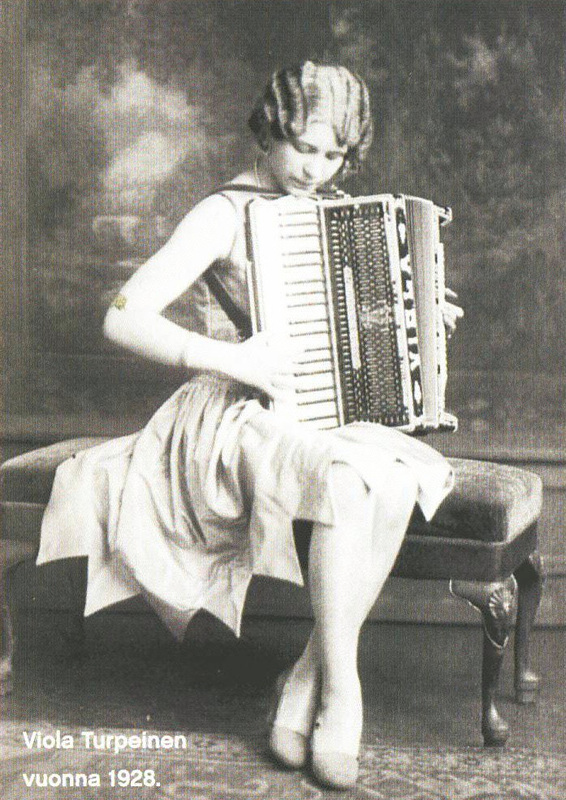 Viola Turpeinen was probably the first woman accordionist to record, and certainly the first female accordion star in America. A second-generation Finnish-American, starting in the 1920’s she played the Finnish dance circuit in the upper mid-west region of Michigan / Wisconsin / Minnesota. Eventually based out of New York, she toured widely and it became a tradition for dancers to see her headlining travelling shows every summer. Turpeinen retired to Florida in the 50’s and lived with her husband in their, “House that Polka built.” She died of cancer in 1958 at age 49. Sadly her place as an American virtuoso and folk-and-ethnic-music pioneer is almost forgotten. Even some accordion-historians inexplicably leave out her remarkably sustained and successful career. She exemplifies how ethnic folk-cultures which eventually assimilated as “white,” seem to have been selectively excluded from the American folk revival. If some sincere Finnish-American folk balladeer in the early 60s had asked her grandparents about folk music their parents had listened to, she might have walked in Turpeinen’s footsteps and become the Joan Baez of the accordion. A Passion for Polka: Old-Time Ethnic Music in America, by Victor Greene. An incredibly rich and detailed book about how ethnic music influenced American culture, from the poorest immigrant bands up to the very top of the popular music charts. A substantial Finnish American Reporter article on Turpeinen, by Carl Rahkonen (reprinted on the Mining Gazette site). There’s some nice stuff about her in connection with Michigan’s Upper Peninsula music scene here. The Finnish Fifty-Records label. (Click on “HISTORIALLISET LEVYT – HISTORIC.” How’s your Finnish?) They were very, very kind and helped us get a large stock of historic Finnish folk and jazz recordings for the Accordion Noir show, so be friendly with them! More from them when we talk about the “Bomb-Squad Polka” in a future post…. And I just found the wonderful photo site of the Finnish Institute of Migration, where they gather information on Finns who, migrated. Finally, I see you can get one of these t-shirts! They’re from the Mesaba Co-op Park, which sounds pretty cool. Founded by progressive Finns in Minnesota in 1929, we could have gone dancing and heard Viola there. ← The first appearance of an accordion in a motion picture…. Artie Music http://www.artiemusic.com has published all recordings of Viola Turpeinen as Viola Turpeinen – American hanuriprinsessa Vol. 1 1928-1929, Viola Turpeinen – American hanuriprinsessa Vol. 2 1929-1945, Viola Turpeinen – American hanuriprinsessa Vol. 3 1947-1949, Viola Turpeinen – American hanuriprinsessa Vol. 4 1949-1951 . The booklets are having the story also in English. Again, sorry for missing this. Hi I think that I have the accordion that belonged to the Welsh lady in question. It was bought from a charity shop in Abergavenny around the time of her death. Unfortunately I don,t have her name but would be interested if anyone can find out….I will keep searching and post anything that I find. I’m interested if there were earlier recordings of women accordionists. I know that influential Irish player P.J. Conlon had a sister, Mary Ellen Conlon who recorded in 1924 or 1925 in New York along with another woman Redie Johnston, both presumably on button-box. I haven’t heard them yet, but I’m working on it. I’d like to find more.